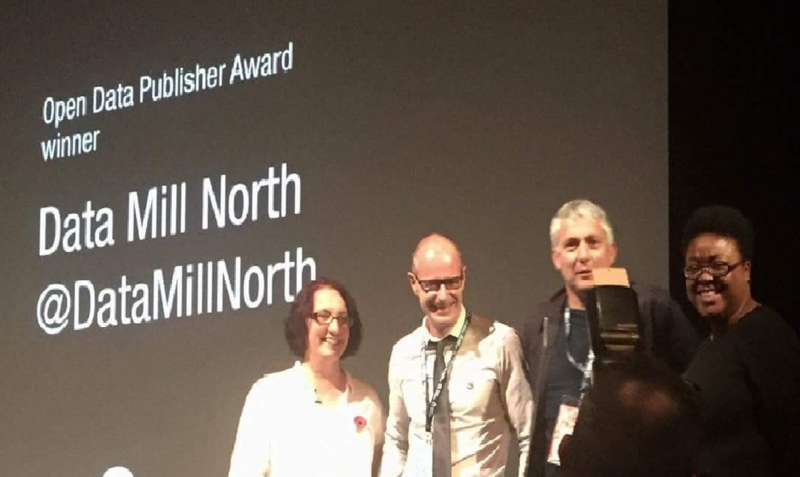 Data Mill North wins ODI Publisher Award! Whilst the US election may have caught the headlines, it is not the only major vote that has recently taken place. In fact, the Open Data Institute has also chosen the winners of their annual ODI Awards, with the Data Mill nominated in the Open Data Publisher category. Despite being up against fierce competition in true Open Data heavyweights DEFRA and AGRIS (Food and Agriculture Organisation of the United Nations), we were delighted to receive the award on the night. The judges were particularly impressed by the Data Mill’s pioneering approach to collaboration, with our ambition being to use Open Data to transcend organisational and local geographic barriers. Our progress towards this goal is noted by the repository currently publishing almost 350 datasets from 43 organisations across the North, including Otley All Saints Primary School, Highways England and many more in between. We have also always sought to use data for innovative purposes, with new apps, websites & analytical tools being developed on the back of our datasets. Some of these innovations have been listed here (https://datamillnorth.org/products/), although please let us know if there are any others that we are unaware of! Similarly, we absolutely welcome any feedback on our website or public requests for additional datasets. Building a community around data and engaging with citizens is as central to our plans as promoting the virtue of transparency, with it really vindicating what we do. This focus on collaboration means that it is difficult to individually thank all of our partner organisations, contributors and website users. Nevertheless, your ongoing efforts and interest in our work is greatly appreciated and a key reason behind our current Award-winning success. However, we are not intending to rest on our laurels! Plans are in motion for further local authorities across the North to use the Data Mill as their main Open Data repository, with announcements to be made shortly. This is an open invitation, so if you’re a public, private or 3rd sector organisation (we’re not fussy) sitting on datasets that aren’t being used to their full potential, get in touch with us – You can never be sure what a developer may create!